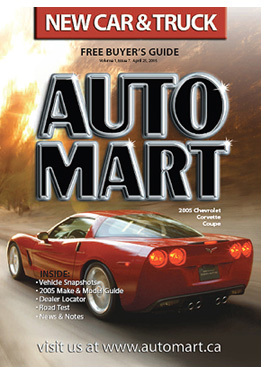 Verified would like to welcome Auto Mart and New Car & Truck Auto Mart, Home & D�cor, New Homes and Renters News, publications from Trader Media Corp., as some of its newest members. Trader Media is one of Canada's leading online and offline classified ad publishers linking buyers and sellers of new and used cars, boats, RVs, motorcycles, heavy equipment, real estate and d�cor. Founded in 1975, Trader Media has expanded its reach through acquisitions and new product development. It has grown to over 65 print publications and many websites. The publications are distributed throughout Ontario. The company's Websites include AutoTrader.ca, AutoMart.ca, HomeGuides.ca, RentersNews.ca, NewHomesandCondos.com, HomeandDecor.ca, and EmploymentNews.com. For more information about Trader Media, visit any of their publication Websites. For information on Verified's products and services, visit www.verifiedaudit.com. Grafica is a print and online general interest newspaper. The online Wizard allows you to update your Circulation Analysis by ZIP/Postal Code faster and easier. Instead of retyping ZIP/Postal Codes each time, this new feature allows you to transfer your ZIP/Postal Code information with the click of a button. To use this new option, click the Add by Zone drop-down list in the upper right of the screen. From the menu, click (Default Zone) and the previous ZIP/Postal Codes will automatically be loaded into the ZIP fields. If you have multiple zones, you will need to click on each zone listed, not just the default zone. You can easily delete ZIP/Postal Codes by clicking the box in the far-right column labeled Del Row. If you need to add rows, click Add. To sort ZIP/Postal Codes in ascending order, click on the word Zone above the first column. Remember to save the information before you submit it to Verified. Newspapers in Education (NIE) is a program created by the Newspaper Association of America (NAA) to provide newspapers directly to teachers for use in classrooms. Verified's clients now report NIE on a separate line on the Quarterly Printing and Distribution report (QPD). NIE copies must be the same paper a reader would get at another location. NIE can be paid for by the school, a sponsor, or through donations, but not by the newspaper itself. NIE cannot exceed 10% of weekly average circulation. If NIE circulation is consistently higher on a single day, the day must be reported on a separate QPD. For more information about NIE, visit nieonline.com. IPA San Francisco conducts a series of Indy Press Thursday receptions. Paid newspaper circulation has declined for decades as people have found new places to gather news and information. Daily newspaper readership has declined by about 1% per year since 1990. "The State of the News Media in America," a study co-sponsored by the Project for Excellence in Journalism and New York's Columbia University Graduate School of Journalism reported that just more than half of Americans (54%) read a newspaper during the week and slightly more (62%) on Sunday. The drop in readership is most apparent with young adults between the ages of 18 and 34. Around 15 years ago, it became apparent that the baby-boomers' children weren't picking up the daily newspaper-reading habit. A recent study conducted by the American Society of Newspaper Editors found that young adults were one-third less likely than their parents to read newspapers daily. This is especially troubling to publishers and advertisers because this coincides with prime consuming years and when readers are likely to establish shopping patterns. So, where have all the readers gone? Only three sectors of the news mediaethnic, alternative, and onlinecontinue to see steady growth. Circulation of Spanish daily papers more than tripled from 1990 to 2002. Ethnic papers are thriving since a growing number of people in the U.S. speak a language other than English. Spanish-language papers have a special advantage because so many nationalities share the same language. The only segment that matches the growth of the ethnic media is the alternative press. In the robust economy of the 1990s, the number of alternative weeklies grew rapidly, drawing national advertising as well as local ad dollars. According to the Association of Alternative Newsweeklies, readership has risen in 2004 to 7.5 million, up from 7.3 million in 2003. Although some research indicates that online media does not seem to be cannibalizing print, there are some exceptions. People who go to online newspaper sites appear to be spending less time reading newspapers in print. In addition, online readership is highest among younger people. Thirty-eight percent of young adults, aged 18 to 29, reported going online for news regularly according to Pew Research Center for People and the Press. In response to declining numbers, current experiments by papers like the Washington Post and Chicago Tribune to produce free papers aimed at a younger audience are being closely watched. These tabloid-sized, ad-heavy papers are aimed at commuters who use mass transit. Large papers in major cities have launched free weeklies, dubbed "faux alternatives," to compete with the traditional alternative papers. Papers are also making inroads into the ethnic market. According to the Latino Print Network, 46 (mostly weekly) Hispanic publications are owned by mainstream news organizations. Is daily newspaper readership dead? Not so, according to Doug McCorkindale, CEO of Gannett Newspapers in a recent Time magazine article. "Our game plan is to deliver information to people when they want it and how they want it," said McCorkindale. "If that's in print, okay. If they want to go on the Website and get the news, that's okay, too." McCorkindale's viewpoint lacks the fatalism of some pundits. "The world is not coming to an end," he said. "[The industry] is more competitive than it was in 1975, but this nonsense that young people don't read is simply wrong." Digital readership had a strong showing in a recent reader survey commissioned by 101communications across four of its technology magazines (Application Development Trends, Campus Technology, Federal Computer Week and Redmond). Results showed that digital subscribers have similar demographic profiles to their print counterparts, are very satisfied with the digital format, and are active participants in content and advertising. In addition, ties of the readers to the publication appear to be strengthened by digital delivery, with 35 percent of subscribers increasing their use of the Website, 31 percent increasing their use of the magazine, and 22 percent increasing usage of publication e-mail newsletters. The Internet-based survey was sent to a random selection of 75,000 digital and print subscribers and conducted in January 2005 by Mosaic Media Partners, with fielding and tabulation by Proximity Marketing. Make sure that all documentation is easy to access. Label reports and files for easy identification. Specify which materials are for the audited months. Create adequate space for the auditor to work, preferably close to the records and individuals they'll be working with. Have a desk and chair ready in a clean, well-lit working area. Assure that there is access to an electrical outlet. Take time to sit down with the auditor to go over your circulation systems and records. Be ready to devote the entire day or days (the amount of time needed to complete an audit varies). If you won't be the auditor's primary contact, make sure they know whom to contact with questions and ask for additional information.